Ping is hyper-local collaboration and communication app designed to support community resilience before and during crisis events. Ping allows people to ask questions, share information, and share resources. The Pacific Northwest is overdue for a major seismic event, argued to be magnitude 9.0. Around the world, climate change has increased severe storms and flooding. Natural disasters have had a significant effect on humanity, but these events are part of our environment. Just in the past 20 years natural disasters have claimed over 1.35 million lives. However, most people are unprepared to handle a natural disaster. In this project we explored the opportunities to help people better respond to natural disasters. Inspired by a New Yorker article on the Ring of Fire and the Cascadia subduction zone in the Pacific northwest, our initial research scope focused in on earthquakes. We knew our initial scope would need to be significantly narrowed. However, we found that earthquakes had few distinguishing factors compared to other large natural disasters when it comes to their effects on society. It made sense to then broaden our scope before narrowing it by looking at natural disasters as a whole, and to understand the phases of emergency management. Our research strategy was to broadly cover as much ground as possible while keeping in mind that we would need enough depth of information to narrow in on a specific user group and issue. What happens after a natural disaster? How do individuals and organizations respond? What are the current issues in disaster management? Fire Chief and first-responder during the Oso, WA landslide. To answers these questions we waded through a massive amount of articles, case studies, frameworks, spoke to responders and a variety of experts with knowledge pertinent to disasters, examined a number of current solutions, and even visited nearby neighborhood Oso, Washington, that has experienced a recent natural disaster. The interviews we conducted with experts, volunteers, and responders, were especially helpful in answering our research questions. Major natural disasters can have a significant effect on infrastructure. Communities that rely on just-in-time inventory will have to undergo rapid changes to meet basic needs. After a natural disaster government agencies focus on mitigation of further loss by overseeing operations from a high level and managing and allocating resources. From the organizational level situational awareness is limited and decisions are made based on the known problems rather than helping those most in need. Due to differences in operational processes and issues of liability, government organizations and volunteers do not commonly work together. However, we found that volunteers and citizens in communities impacted by natural disasters can be an incredible and reliable resource after a disaster. In situations when infrastructure damage has isolated communities, local citizens are often the only ones that can help. One of the only guarantees after a natural disaster is that survivors and volunteers will come together to help each other out. Locals are more suited to respond than governments and external relief organizations because of their knowledge of the area or specialized skills. Even though people want to help, and are capable of doing so, sometimes they don’t have the right information to do so effectively. People improvise and use everyday digital tools that they have used before in response efforts. They do not use disaster specific solutions. To help visualize and combine our research we created an experience map showing what happens after a natural disaster, how key players are involved, and what infrastructure is likely available. Our final design direction was shaped by the insight that a bottom up approach of enabling individual survivors to contribute information, resources, and expertise to the larger cause of response and recovery is more effective than top down methods commonly employed by government organizations. Hyper-local communication tools were also thought to be particularly promising to our SME Kate Starbird, since they enable locals to coordinate more efficiently without the complications of introducing an emerging crowd. Historically, attributed to the sporadic frequency of disasters, the tools used among volunteers are common and accessible, meaning that products and solutions designed specifically for disasters are forgotten when they are finally needed. We then examined tools and products that have been used in volunteer emergency response and suitable alternatives. Existing products for communication and organization work well for daily needs, but even the most popular ones leave a lot to be desired in the context of disaster response. We looked at expanding upon one of these platforms to improve where it falls short, but ultimately decided a standalone approach would be the best. The main reason for this was that we wanted to support local collaboration and location based information sharing. From our research we identified a number of possible design directions and we explored the design space through structured sketching sessions. Each round of sketching we individually generated as many solutions as possible in 15 minutes. 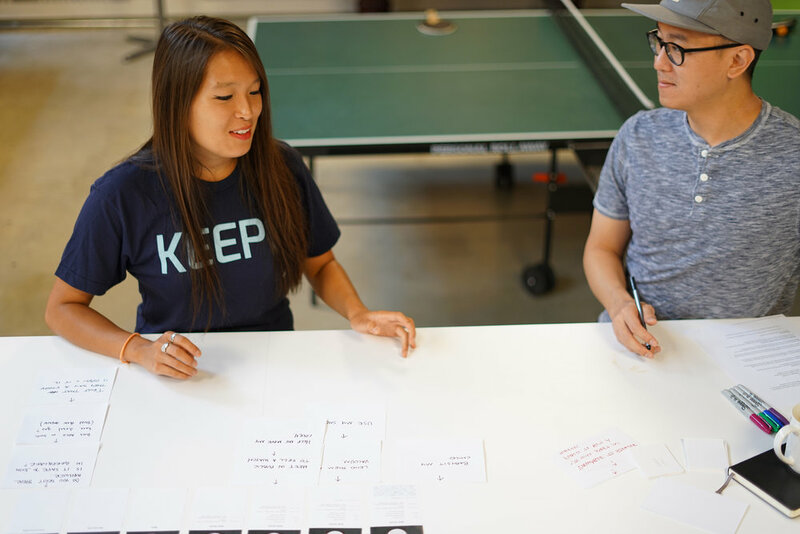 We shared each concept at the end of the round which helped inspire new ideas and limit duplicates. At the end of several rounds of sketching, we had generated over 200 ideas. We then organized, grouped, and combined the ideas into design themes. Finally, we discussed and evaluated the ideas based on strength, feasibility, and novelty, and filtered down to 13 concepts to further explore. The 13 concepts were then further combined and developed into 8 storyboards. Each storyboard was accompanied with a clear description of the problem it solves and why the problem is significant. The deliberations to arrive at the final design direction were somewhat contentious. We had narrowed down our concept directions to either a system to share skills or share resources. Our team was split in which concept would be more promising. Which concept would be more successful prior to a disaster? Which concept had the greater positive impact on survivors? We eventually agreed that local communication and collaboration, a core function of both of these concepts, was closer to the core problem that we were interested in solving. There are obvious difficulties prototyping a solution in the context of a natural disaster. Knowing that we could not recreate the likely emotional, psychological, and needs based stress involved in the wake of a natural disaster, we found proxy scenarios to design against. For example instead of prototyping an evacuation effort, we prototyped a camping trip planning experience. Working towards a hype-local communication product for collaborative work, we had several design goals that were especially critical. Is there a balance between information that people are comfortable disclosing and information that is required to evaluate trustworthiness? During the prototype evaluation we presented participants with example profile pages with varying levels of information and ask them to rate the profile’s trustworthiness based on a variety of actions. In a second phase, we asked how comfortable participants would be if the profile was their own and shared with the public. The final phase all attributes of the full profile are broken apart, and the participant was asked to rank how valuable this information is to them. Information about mutual friends can build trust, and sharing this information does not compromise privacy. Sharing a person’s current location is not useful for building trust and is a privacy concern as well. How can we improve resource and information sharing within a local community & where do existing tools fall short in collaborative decision making? Asking participants to imagine a scenario that they have not experienced, such as an evacuation after a natural disaster, can lead to inaccurate results. So we sought out a more common parallel scenario: a group camping trip. A group of 4-6 people were asked to coordinate plans and supplies under time constraints. In the pilot version of the activity, the group was asked to complete this task with one member acting as the group leader. The leader was given a short checklist and asked to document the planning process using pen and paper and verbal communication. In the subsequent activity, a similar sized group was asked to complete the same task with digital communications exclusively, using a chat room and a shared google doc. When groups are planning around a shared activity, there are lots of small decisions that need to be addressed. These decisions can be tedious to address and find group consensus using verbal communication. 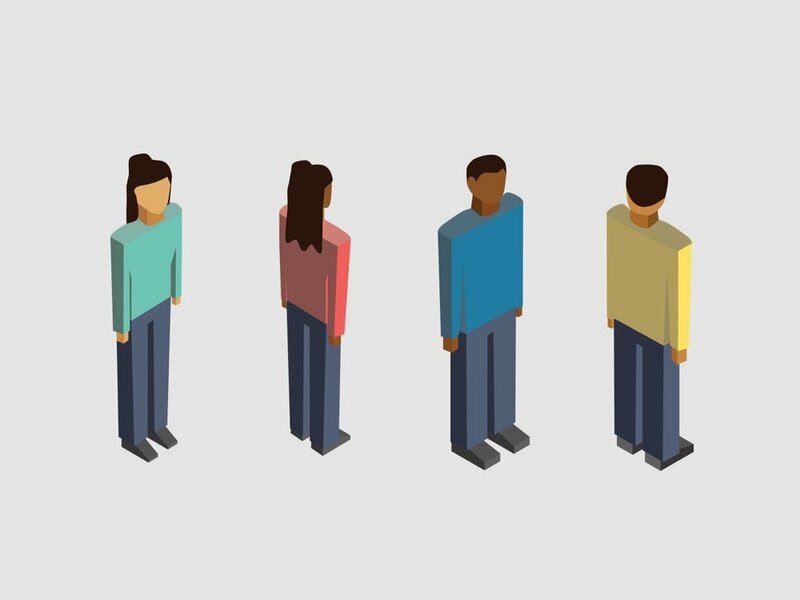 Do individuals feel more comfortable requesting favors from strangers in close proximity to strangers that are further away? We conducted a behavioral prototype to answer this question. We were interested in the potential differences in behavior during an emergency and introduced participants with a mock disaster scenario. To account for discrepancies in typical behavior we asked during the exit interview if their actions would be the same in a non disaster scenario. For this prototype, we recruited three adult participants: two women and a man ages 23- 31. Participants went through a time-sensitive scavenger hunt to emulate the stress of disaster response. We used a customized Slack group to simulate functionality we had in mind for our design solution. We created channels labeled “five minutes away,” “30 minutes away,” etc, to emulate location-based groups. Second, we added distances to usernames to let the participant know how far away the people they were talking were. We also included a channel titled “nearby friends” allowing participants to access people they had already connected with. People prefer reaching out to friends and people in their immediate vicinity when asking for help, but they are willing to go beyond this for help in times of crisis. For information seeking that doesn’t require meeting in person, participants did not necessarily prefer friends to strangers. We chose to create a mobile application hoping to make Ping accessible to as many people as possible. One of our main concerns with a mobile solution was access to infrastructure. Yet through interviews and secondary research we found that cellular networks are surprisingly resilient. Also, the Bluetooth technology included in most phones can be leveraged as a fall-back to connect devices when cellular connectivity is compromised. Our solution is a mobile communication application designed to support survivors in an urban environment before and during a crisis events. Ping allows people to ask questions and share resources, building community resilience through location based chat. In the wireframing process we explored a few different interaction models, which we later simplified and combined. Ping was conceptualized around six design principles established from our research. Understanding your surroundings, or “situational awareness,” is one of the top priorities after a disaster. It is necessary to prevent further damages to property and to keep you safe. Due to the chaotic nature of disasters and infrastructure failures, it can be tough to get current information. An example of this from our research is disaster survivors who had difficulty knowing which stores were open to get the supplies they needed. TJ McDonald of the Seattle Office of Emergency Management remarked that situational awareness is especially low in the places that have the most damage and need the most aid. Information discussion groups are location specific groups for crowd-sourcing information. Nearby information groups can be viewed in either the list or map views. A combination search and add new input field was designed to aid in rapidly finding information while reducing duplicate discussions. Since Information Discussions are location specific, the participants in the thread are all local to the inquiry helping to reduce irrelevant and incorrect information. Although people come together to volunteer and offer aid in times of crisis, they often do so in a disorganized fashion. This can result in extreme mismatches of donations to need in type and quantity of donations. Also, during the camping activity we observed our participants having frequent discussions to gain consensus on each item they planned bring. This often resulted in lengthy back and forth discussions to reach consensus. In the List Feature screen the chat input field has been repurposed to enter new items to the list. Each item has a quantity of people requesting this item. A swipe left on the item requests it, while a right swipe will mark a contribution. A dialogue to enter the quantity is shown for both requests and contributions. Finally, items can be discussed by tapping on the item. Incorrect, repeat, and irrelevant information, also known as noise, commonly occurs in the wake of a disaster. Ping deals with noise in multiple ways. Communication is scoped to specific locations so that discussions are limited to within an area or neighborhood. Although communication through Ping are synchronous and conversational, messages of importance can be pinned. The ability to pin items is an attempt to reduce repeat information. The pinned message toggle is prominently placed at the top right of the screen. When the toggle is switched on, non-pinned items are animated away and the pinned items are compressed into a short list. Group chats are another method to reduce noise and further scope conversations. Groups are also searched for and created through the same input to reduce duplicates. We designed Ping to be durable against infrastructure damages after a natural disaster. In the case of cellular network disruptions, Ping switches to a Bluetooth mesh network mode. We hope that Ping will be used before a disaster. This won’t always be the case, so Ping has a SMS interface for people who don’t have it. SMS is one of the most robust communication protocols, meaning even those who do have the app can use it as a fallback. Similar to Twitter, Ping also has a SMS interface. New messages are sent via text and the application can be interacted with special text based commands. The above example shows the interface in both the app and SMS for the Capitol Hill Volunteers group. We were warned by our subject matter experts multiple times not to design a disaster only solution. Ping is at its core designed for natural disaster response, but also with day to day utility as well. Ping’s location based chat groups are not limited in anyway to disaster specific applications, meaning groups can be created as people see fit. In the above example is a group for dog owners. This type of flexibility is necessary to help build a user base and ultimately encourage Ping’s use for disaster scenarios as well. The list feature is also generalizable to daily use. The example above shows how lists can be used to plan a potluck with friends. During our profile prototyping activity, we found that mutual friends and groups were important in establishing trust with a stranger. In our secondary research we found that trust can be defined as the inverse of risk. These findings helped guide the design of profiles. Mutual friends and groups are not sensitive information but can help establish trust. By sharing this information with the public, we assume that privacy is protected and the opportunity for interaction increases. We have also observed during our competitor research analysis that anonymous profiles seem to have a negative effect on the social culture of an app. The user profiles page use the actual first name of a user. Our test participants generally felt that first name and profile images were safe to share with the public. The Thanks ranking system shown in the far right screen allows individuals to receive thanks for good deeds and helpful information. Telling a story with instances of tragedy and loss requires tact, and it took some time to get this right. We wanted the tone and presentation to be considerate of people who have suffered from tragic events, avoid sensationalism, and encourage positivity. To do this we decided to use real-world imagery sparingly, and relied more on an abstract visual communication that would still evoke the right tone and message. These were consistent across our presentation, poster, and video. Our project culminated in a presentation to industry and faculty for the MHCI+D capstone. We received some insightful feedback, enthusiasm for our design, and stories of their own experiences with natural disasters. Some of the feedback included concerns about how our solution could be applied to rural areas. The original application of our solution was designed for urban areas, but with the right hardware rural areas could be supported as well. This project’s success relied on our fantastic and talented team. We worked organically and were always able to quickly resolve any issues or disagreement. The ideation and prototyping process we employed was to arrive at the right design. The next steps would include building a functional MVP and testing it with users. It could also be helpful to show our design to some of the experts we have talked to during our research phase and even volunteer community groups that focus on earthquake resilience, such as Seattle Neighborhoods Actively Prepare.